Response to this puzzle was the best we have had in the last 3 months – so thanks a ton…particularly want to thank all the friends from UK, Singapore and Greece who came in large numbers this time! The first correct answer was from Akash Tayal, though he had an unfair advantage of being a Chemical Engineer, and thinks 3D by definition! Many others, including Jeba, Rohit, and then from Lalitha Bhaskara (an ex-colleague from SAP) also sent correct answers. Also got a creative answer from Rhea Mittal from Mumbai. I am taking the liberty of reproducing some of the answers I got. The trick is to think 3D, which is where “outside the box” comes in the title. 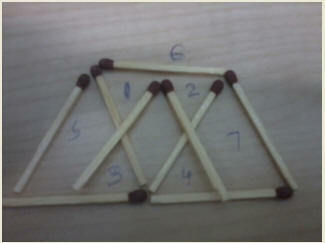 Taking the existing triangle as the mid plane, with three matches more on each side you can create two pyramids that share the existing triangle as the base. 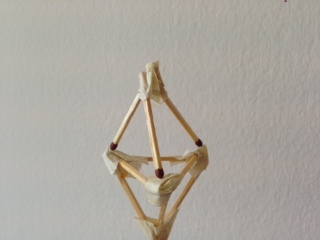 Total of six external face triangles and one common base triangle. Also attaching the answer from Rhea. It is not 100% correct by the strict definition of the question, but a very creative answer – well done Rhea.